The history of Bryant Lodge reproduced below is taken from the documentation and report required by Section 106 of the National Historic Preservation Act when projects to repair historic buildings receive federal funding. Renovation of Bryant Lodge, which is eligible for listing on the National Register of Historic Places, is currently underway (September 2016). The report was prepared by Mary Jo Llewellyn, Architectural Historian, in 2014. Bryant Camp is historically significant because of its association with some of the earliest skiing activity in Vermont as well as its on-going association with outdoor recreation and tourism in the State. The Green Mountain Club completed the Long Trail from Sterling Pond on the east side of Smugglers Notch to Camels Hump in 1912. When the LT was cut through Bolton Valley the land was owned by a lumber company which presumably gave revocable permission to the GMC for the trail to pass through its property, as was the common practice at the time. The original path of the LT passed over summit of Bolton Mountain and descended to the southeast generally following the Joiner Brook drainage until it reached the Winooski Valley. 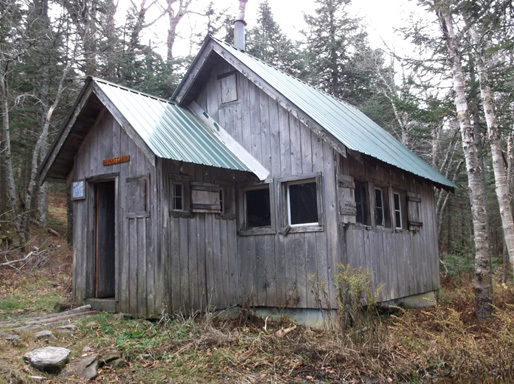 By 1918, the GMC had constructed Dunsmoor Lodge, a very primitive, rather make-shift three-sided trailside shelter approximately 1¼ miles southeast of summit of Bolton Mountain. The 1922 Map of the Long Trail (Map 2) shows that below Dunsmoor Lodge, the LT followed a skid road or work road, past a clearing, ultimately joining a gravel road that followed the course of Joiner Brook down to Bolton Village in the Winooski Valley. Bolton Lodge, constructed adjacent to the original Long Trail by the GMC in 1928, is presumed to be sited on the clearing indicated on the 1922 LT map. By 1932, Dunsmoor Lodge had been abandoned by the GMC. The Long Trail was relocated away from Joiner Brook when the access road to Bolton Valley Ski Area was constructed in the late 1960s. Edward S. Bryant, forester, surveyor and conservationist from the Boston area, purchased large tracks of land in Vermont in the 1920s and 1930s, including what is now Waterbury Reservoir. In 1922 he acquired 4,000 recently- cut acres in the Joiner Brook drainage on the east side of Bolton Mountain. Bryant continued to allow others to hike and hunt on his Bolton Valley property but did not allow any cutting of trees. He also encouraged reforestation and reportedly planted plantations of Red Spruce. Edward Bryant was also a pioneer of skiing in New England. It is believed that his interest in the Bolton Valley property was not the value of the timber it could produce, as much of the land had been recently cut, but because its terrain and substantial snowfall were particularly suitable for downhill skiing. In the late 1920s Bryant hired Otto Schniebs to help design and cut ski trails on his property. Schniebs, a native of Germany, is well known among early exponents of downhill skiing in the US. He opened the first ski school in the country in Waltham Massachusetts in 1927, was the first director of the US Eastern Amateur Ski Association’s school for ski instructors, coached at Dartmouth College and St. Lawrence University and designed the ski trails on Whiteface Mountain. Some of the ski trails cut by Bryant, and perhaps by Schniebs, including Snow Hole, North Slope, and Heavenly Highway, are still in use as part of the Bolton Valley Nordic Center/ backcountry trail system. In association with his efforts to promote skiing, Bryant constructed three primitive cabins in the Valley – the lower, middle and upper cabin – apparently as shelters for skiers and others using the land. The upper cabin was the only one built on land owned by Bryant and is the only one still standing. The lower cabin, reportedly sited near the bottom of the valley and Route 2, was easily accessible by auto. Access to Bryant’s higher cabins coincided with the path of the Long Trail for a ways up the valley but at some point veered off to the east following one of the many existing logging roads in the area. 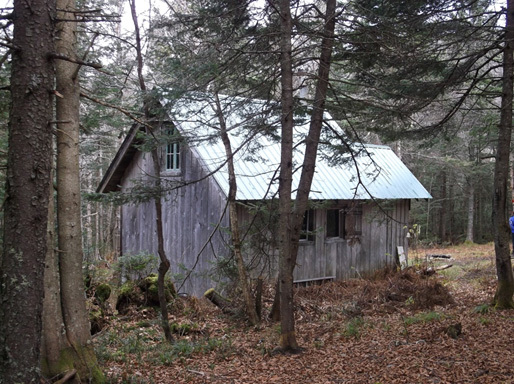 Ike Isham, a former Burlington resident and an early user of Bryant’s ski trails and cabins, reported that the middle cabin was located above the end of the gravel road, “near Bolton Lodge on a logging road that followed the easier drainage”. Mr. Isham also remembers that in the late 1930s “one could not get up to Bolton Lodge in a good car, and that they sometimes hitched rides in logging vehicles”. Travel further up the valley to the upper cabin, now referred to as Bryant Camp, was presumably also on an existing logging road. Bryant’s 1947 map of “Ski Trails Bolton Mountain Area” (Map 3) showed that access onto his property was via what was identified as “Winter Road and Ski Trail” that lead northeast to the upper camp, from which Bryant’s ski trails could be accessed. The Winter Road/Ski Trail may also have been passable in some vehicles. There is some evidence to suggest that Bryant Camp may have been constructed near the site of Dunsmoor Lodge but that possibility has not been confirmed. The upper camp/Bryant Camp may have been constructed as early as 1927. Burlington resident and long-time Bolton skier Clem Holden, who was born in 1922, remembers skiing up to the upper camp as a boy scout in the 1930s. Following his service in WWII, Ike Isham attended UVM and recounted one overnight ski trip made to Bryant Camp with several UVM friends. 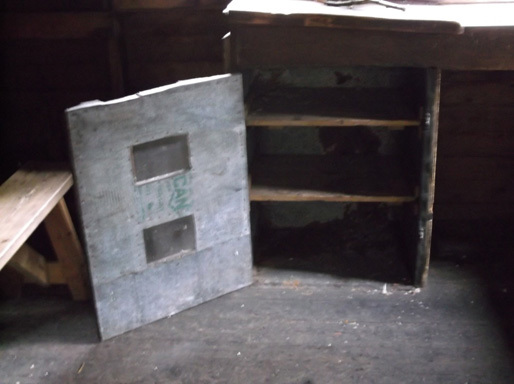 Photographs of that outing which Mr. Isham has donated to the GMC show that at the time the camp was sheathed with tar paper attached with wood strapping but otherwise appeared as it does today. Lift service skiing was introduced in Vermont in the late 1930s and after WWII Edward Bryant undertook plans to construct a ski lodge and install a rope tow to carry skiers to the top of his trails in the Bolton Mountain area. Ike Isham was one of several young men hired in the fall of 1946 or 1947 to cut timber with which to construct the lodge. While working for Bryant, Isham and the others lived in the middle camp. A foundation was apparently also dug but the lodge was never completed. It is reported that Bryant was unable to obtain financing to install the rope tow. Although Edward Bryant was unsuccessful in developing a lift service downhill ski area, his ski trials and upper camp were used by skiers, the Boy Scouts, the UVM Outing Club and others from Burlington and elsewhere as long as he owned the land. When Bryant died in 1951, his Bolton Valley property was sold to Plant and Griffith Lumber Company in Jonesville, Vermont. Although timber was presumably again harvested on the land, Bryant Camp was undisturbed and people continued to ski in the valley and use the cabin. In 1963 Plant and Griffith sold 8000 acres of their Bolton holdings, including Bryant Camp, to Roland DesLauriers. DesLauriers and his son Ralph formed the Bolton Valley Corporation and in 1966 Bolton Valley Ski Area opened. 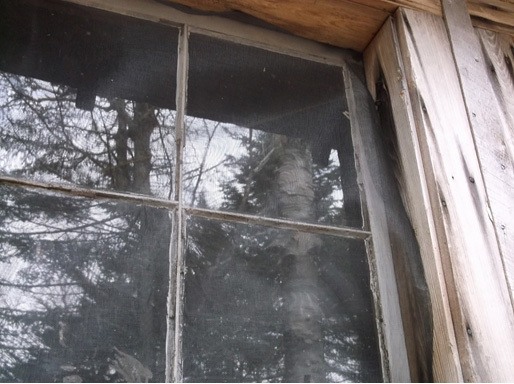 During the time that Bryant Camp was owned by the Bolton Valley Corporation and its successors, the building and Bryant’s ski trails were apparently initially maintained informally by Clem Holden and other skiers including Bolton resident Gardiner Lane. In the late 1960s Lane established the cross-country ski center at Bolton Valley Resort. The cross-country center incorporated Bryant’s earlier ski trails as well as numerous newer groomed and backcountry trails cut by Holden, Lane and others, including Gardiner’s Lane. 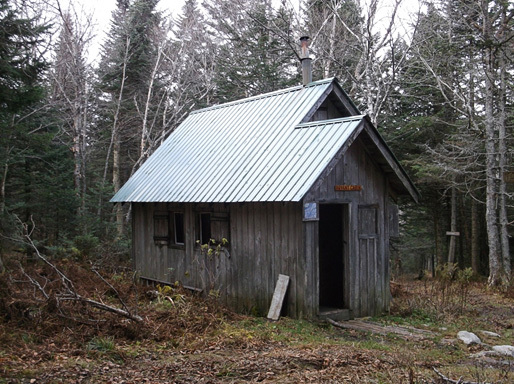 Bryant Camp became the hub of the extensive network of backcountry trails that branched out in all directions from the small building. It continued to be a destination for people skiing the backcountry trails at Bolton Valley Resort, which eventually made the cabin available for overnight rentals. 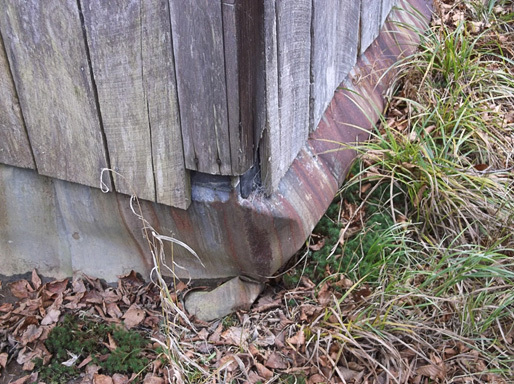 Gardiner Lane is known to have undertaken repairs to Bryant Camp and may have replaced the original tar paper sheathing with the existing board siding. It is also reported that he terminated use of the privy in the entry vestibule. The Catamount Trail, which was opened in 1984, passes right by Bryant Camp on its way up to the Bolton-Trapp traverse (cut by Gardiner Lane and Johannes von Trapp in 1972), the most exciting and difficult section of the end-to end ski trail. Bryant Camp is one of only a few overnight shelters directly on the Catamount Trail and is considered to be an important resource for users of the CT. In February 2011 the public learned that much of Bolton Valley Resort’s Nordic and backcountry land and Bryant Camp were to be sold to a private interest and that public access to the area would be lost. A group of community members and Bolton Nordic skiers formed the Friends of Bolton Valley Nordic in hopes of finding a way to protect the land from development. The group elicited the help of the Vermont Land Trust which in 2012 signed a contract with the Bolton Valley Ski Resort to purchase the land, contingent on its ability to raise the $1,050,000 purchase price. The VLT and many volunteers worked for 14 months to successfully raise the funds to complete the purchase. 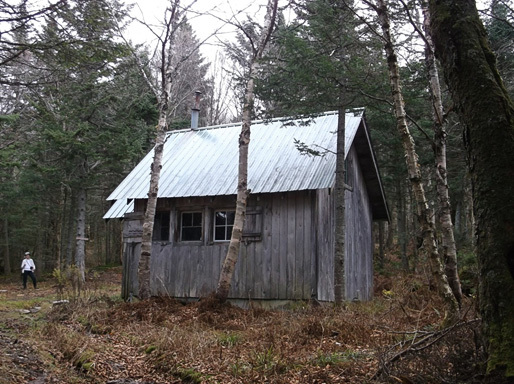 Bryant Camp, now located on protected state-owned land, in the middle of the Bolton Valley backcountry ski trail system, adjacent to the Catamount Trail and very close to the original path of the Long Trail, has also been protected. The building will continue to provide overnight shelter for skiers and others using the trails and land, just as it has done for nearly 100 years. Photo 1. Bryant Camp, Bolton VT. View NE, showing west (front) and south elevations. Note covered entry which houses an original now-discontinued privy and wood storage area. The existing sheet metal roof is in Good condition and will be retained. 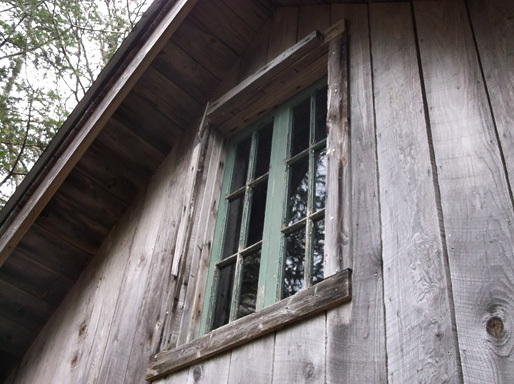 The small rectangular window in the west gable peak opens into the sleeping loft; the window will be enlarged as an egress window. Photo 2. View NW showing the south eave and east (rear) gable elevations. Note metal stove pipe located on the ridge just south of the west peak. The chimney and woodstove will be removed. A new woodstove and Metalbestos chimney will be installed against the southern half of the rear wall. The new chimney will pass thorough the east wall plane as an exterior chimney that will extend the above the south roof slope the required distance. Photo 3. View SW showing rear (east) and north eave elevations. Note that the bottom of the north wall is buried in organic material and dirt. The grade is too high and the sloping site is very wet so that the bottom of the wall is unable to dry out. As part of the work to repair the foundation, the building will be raised approximately 12”on the north side. Drainage swales will be dug along the north and east elevations. Any required repairs to the floor framing and sheathing will be made in-kind. Photo 4. View SE, showing north eave and west (front) gable elevations. 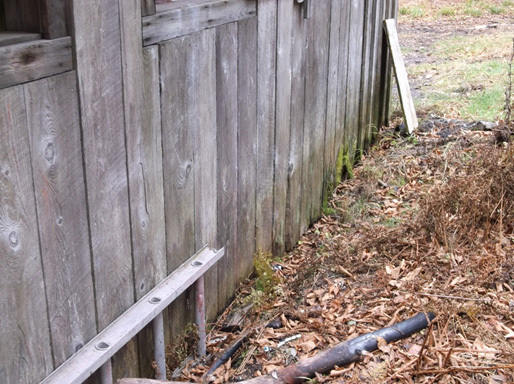 The bottom of the north wall and the front wall of the entry are moss-covered due to the high grade, excessively wet sloping site and failed foundation piers. The log ramp at the entry bridges over the mud in front of the Camp. An additional drainage swale will be installed uphill to catch and redirect water flowing down towards the cabin from the northwest. Photo 5. View NW, showing the rear SE building corner. Bryant Camp is held on corner piers apparently made of built-up 2x4s of unknown depth. The very wet site conditions, poor drainage and frost cycle have allowed the building to heave so that now the piers are at uneven elevations and do not support the building adequately. 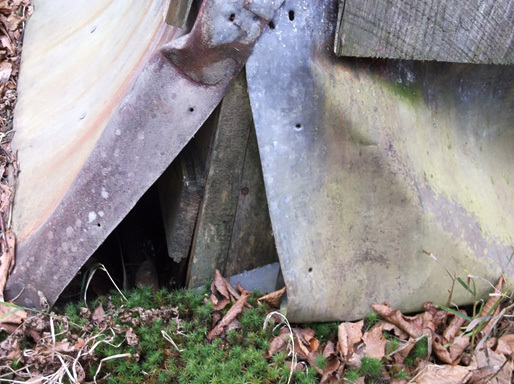 The sheet metal shirting installed to keep porcupines and other animal from beneath the building has bent as the camp has heaved. Photo 6. View N, showing the SW (front) pier. Note that the pier has heaved, is no longer level and does not hold the building sufficiently above grade. New wood piers that extend to the frost line or to ledge will be installed. Rigid insulation board will be placed around the piers below grade to reduce frost heaving. New sheet metal skirting will be installed around the perimeter of the building. Photo 7. View SE showing the bottom of the north wall which is deteriorated due to the high grade, wet site and improper drainage. If the bottom of any sheathing is so deteriorated that the floor frame and floor system are unprotected, it will be repaired with a bevel-cut splice. It is hoped that correction of the site conditions will allow the existing sheathing to dry out. Photo 8. View NE, detail of a typical 4-light fixed sash. The existing windows will be retained and repaired as needed. Any broken or seriously deteriorated muntin bars will be replaced in-kind. The wood windows will be re-glazed and repainted. The paint will extend approximately one-eighth of an inch onto the glass. Photo 9. View SW, showing the typical interior surface of the windows. Some windows are hinged at the sides; others are hinged at the top and held open on long metal hooks. Both the interior and exterior surfaces of the windows will be repaired as needed, re-glazed and painted. Photo 10. View SW, showing the atypical, two-leaf casement window in the east gable elevation. 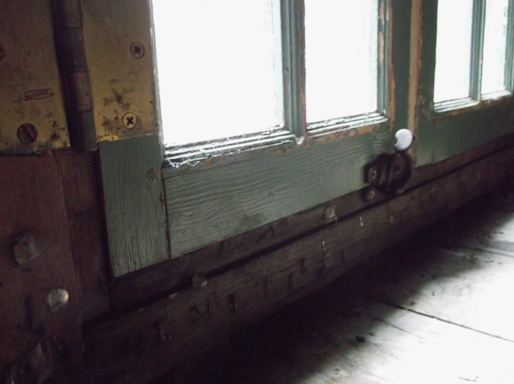 This window lights the loft level and will be retained, repaired and repainted. The new stove pipe will pass through the east wall below and to the south of this window. The new interior stairs to the loft will pass through a new opening in the east end of the loft floor near the window. Photo 11. 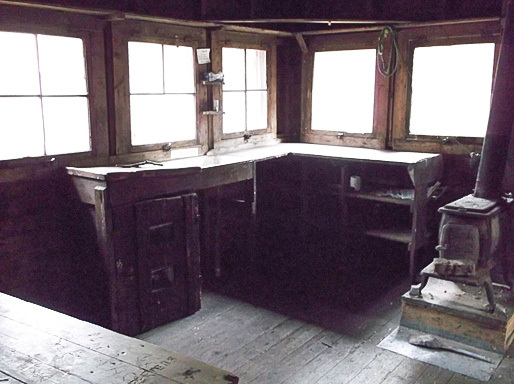 View SW showing the west (front) interior wall, portion of the L-shaped built-in counter, old woodstove and 2 x 4 ladder to the loft, incorporated into the west stud wall framing and door opening into the vestibule. 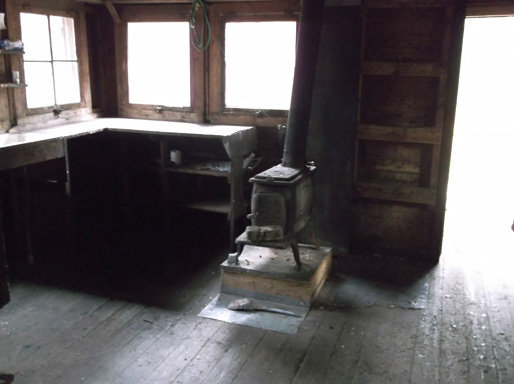 The stove will be replaced and relocated to the opposite east wall, the counter will be removed. Use of the ladder will be discontinued but the ladder will be retained. Photo 12. View NE showing the north and east interior walls and loft floor. 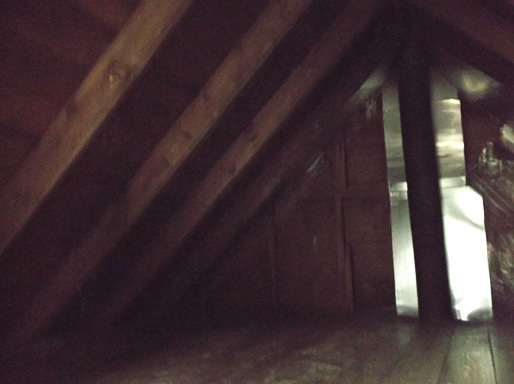 Note the person on the right who is climbed up the built-in ladder in the east wall into the loft level. This ladder and a similar one in the west wall are the only means of entering and exiting the ladders. New stairs to the loft will be built in this corner of the main level. Use of the ladders will be discontinued when the stairs are built. The existing ladder opening in the east end of the loft floor will be incorporated into the new larger stair opening. Photo 13. 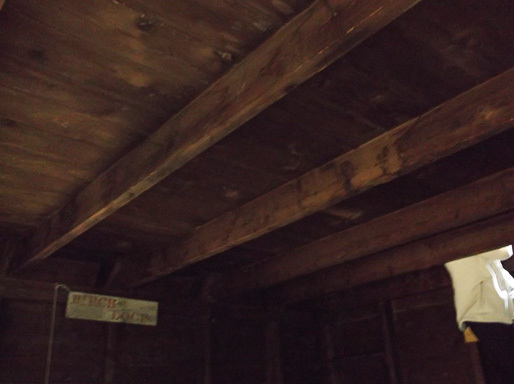 View NW, showing the NW corner of the loft, the existing stovepipe that passes through the loft floor and the roof above and the sheet metal added on the west wall behind the pipe. The sheet metal covers the window in the west gable that will be enlarged as a second means of egress from the loft. The new window will open inward due to the wide soffits. Photo 14. View SW showing the L-shaped built-in counter. The counter may be original but it is dated and worn and will be removed to provide needed space for a table. The counter surface is useable but the sink is non-functioning and much of the shelve space is awkward to use, especially in an unlighted interior. Photo 15. View S, showing the portion of the built-in counter east of the sink on the south wall. A sheet-metal- covered wood panel apparently was made to fit over this section of shelving, presumable as some sort of an ice box. The counter and shelving will be removed to provide needed floor space on the main level.